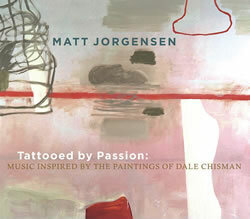 Inspired by the paintings of his late father-in-law, the prominent abstract-impressionist artist Dale Chisman, drummer Matt Jorgensen has created a recording of all original works drawing influence directly from Chisman paintings, his home city of Denver, his life-long friends, and his constant reinvention as an artist. To properly reflect the power and expanse of Chisman’s pieces, Jorgensen, along with his longtime collaborators – trumpeter Thomas Marriott and saxophonist Mark Taylor – expands his own palette from previous recordings, exploring broad new textures and musical landscapes aided by Corey Christiansen’s earthy guitar work, bassist Dave Captein, and orchestrations for string quartet. Mixed by Don Gunn at The Office, Sept-Oct, 2009. Mastered by John McCaig at panicStudios, Nov, 2009.